When it comes to 'winning the internet', social media influencers are at the top of the podium. Their outstanding work and online presence are the primary contributors to this ranking, and their opinions have a deep and powerful impact on people. An increasing number of people are following such influencers, often subscribing to their channels so they don’t miss out on their content. In turn, brands are flocking to such influencers for mentions, reviews, and recommendations. Not to mention partnerships for social advertising campaigns. These factors indicate the true value of their influence, and symbolize why everyone wants to be an influencer these days and with the right influencer marketing agency, you might just have a shot. There’s a long list of top social media influencers who are growing exponentially in their respective niches. And with 39% of brands planning to increase their influencer marketing budget this year, influencers are more in the public eye than ever before. We’ll take a look at some of the most renowned social media influencers today. They don’t just have massive followings, they also have tons of believers. The top of this list is occupied by a member of both traditional and social media's most royal family: The Kardashian's. Love them or hate them, they are the quintessential family of entertainment. And they are absolute forces on social media. So number one on our list is none other than the queen of Instagram; Kendall Jenner. Beyond the fame that comes with being a member of the Kardashian clan, Kendall has more than made a name for herself in the modeling industry. She was just 14 years old when she was signed on to Wilhelmina Models modeling agency, and has taken part in campaigns for some of the most famous brands in the world including Chanel, Marc Jacobs, and Dolce & Gabbana, plus so many more. Jenner has been dominating on social media for years now, and due to the recent exposure of the Fyre Festival fallout through documentaries like "Fyre", Jenner has seen her profile only continue to rise, after it was revealed she was paid $250,000 for a single Instagram post. Felix Kjellberg, better known as PewDiePie, is a Swedish social media influencer and YouTuber who has turned himself into somewhat of a household name. His YouTube subscriber base alone is approaching 84 million now, and he is the most followed YouTuber of all time. He also entertains enormous audiences on Instagram, Facebook, and Twitter as well, with a combined audience of well over 100 million people. PewDiePie has been criticized multiple times for creating inappropriate and insensitive content, the social media superstar maintains extreme popularity online, and it's estimated he made over $15 million dollars last year despite the fallout from the controversies that surrounded him. He has also leveraged his online fame to launch a limited edition apparel line. He's the undisputed king of YouTube, and his influence on social media is massive across all networks. Seriously, who hasn’t heard about Gary these days? He’s the guy who expanded his father’s wine business from $4 million to $60 million. He’s also the chairman of VaynerX, and the CEO and co-founder of VaynerMedia, which has worked with companies like GE and Unilever. He is most notably known to move marketing budgets of many Fortune 500 companies to social media marketing. The 4-time New York Times bestselling author also runs a popular vlog series on YouTube, #DailyVee, where he documents his life as an entrepreneur. As if that weren't enough, he also has an exclusive show on Facebook, #AskGaryVee, where he answers social media questions. Gary has arguably become the face of social media entrepreneurship for our generation. His Instagram profile is largely filled with pictures of himself with motivational quotes for entrepreneurs. And his LinkedIn profile has some very interesting and valuable article content. 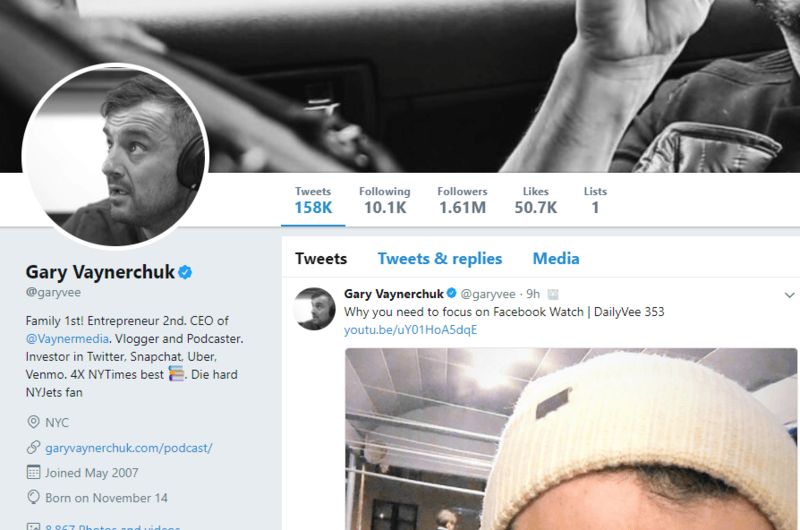 Nobody passionately endorses the power of social media and influencer marketing more than Gary Vaynerchuk. It's amazing to watch the man seamlessly manage so many ventures in a day! If you want to learn how to promote your personal brand and your business - particularly in today's digital landscape - Gary Vee is your guy, plain and simple. These dudes got it going on. Dude Perfect is a sports entertainment company, started by five close friends and former high school basketball players. The group rose to fame soon after publishing its first viral basketball trick shot video on YouTube back in 2009. Dude Perfect has become famous primarily for showcasing their mind-boggling trick shot videos, competitions, and challenges of all types across social media. The dudes have also started an online merchandise store, their very own television series, and multiple mobile apps. The simplest way to put it is; these dudes are killing it. As you can tell from the above Walking Dead promo, Lele Pons has made it big time. She loves getting a laugh out of her audience on social media and has been affectionately dubbed the skit queen of Instagram. And her year-over-year growth shows she has what it takes to make it in any sector of social media. The 22-year-old Venezuelan-American often incorporates slapstick comedy into the practical jokes contained in her hilarious video content. What may come as a surprise to some is that Pons came to prominence initially on Vine, where she was the most-followed and most-looped individual before the platform shut down in 2016. She transitioned that viewership primarily to Instagram, and as they say, the rest is history. Jake Paul might just be Logan’s little brother to some, but in the world of social media, he’s a huge star all his own. Much like #5 on our list, Lele Pons. 22-year-old from Cleveland and started his career on Vine and is now enjoying his celebrity status in the Southern California sunshine. His content could be categorized as sensationalist by some, and they wouldn't be amiss in that assessment. For example, one of his YouTube videos features Paul as he suspends a trampoline from a helicopter. Jake also shares equally outrageous content on Instagram, his second largest social channel. Like him or not, Paul displays an admirable entrepreneurial drive. He created Team 10, a group of young social media influencers who live together and frequently collaborate, in addition to his own social media company and venture capital fund. Paul is quickly ascending into the pantheon of social media stars, and his influence is nearly unmatched among the millennial demographic. Huda Kattan is a heavy hitter on social. She has more Instagram followers than any other top influencer on our list outside of Kendall Jenner and Lele Pons, with a jaw-dropping 32.2 million followers. The businesswoman and influencer mixed her entrepreneurial background with a lifelong passion for makeup to create her own beauty business, Huda Beauty, in 2013. Over the past few years, her makeup line has become one of the fastest growing beauty brands in the entire world. Kattan got her start in social media stardom as a blogger, but now uses all platforms of social media to cover the latest beauty industry news. The combination of her blogs, YouTube videos, and Instagram Stories offer beauty tips and tutorials in various forms. In June of 2018, Huda Boss, a reality show series on Huda Kattan’s family, business, and personal life aired on Facebook Watch and has since become a huge success. Huda is an undeniable force on just about every social platform, no bones about it. Andrew Bachelor, better known by his online alias King Bach, is an actor and social media influencer. Originally from Canada, Bach moved to Florida as a child, and then to Hollywood to study improv at The Groundlings, a famous comedy group. His exuberant personality earned him the title of most-followed Viner in 2015, making him another Vine outcast who has transitioned their fame on the now-defunct platform to other social platforms. So while Vine has long disappeared, Bach’s celebrity status has only grown. Andrew maintains two YouTube channels: BachelorsPadTv and Bach Vlogs. Bachelor also had roles in shows like The Mindy Project and Punk'd, among other countless appearances in TV shows, movies, and commercials. Bach is one of the few examples of social stars who turned their online fame into mainstream celebrity. There's a reason his name is King Bach: he's social media royalty. Alia “Lia” Shelesh, is more popularly known by her alias and gamer tag, SSSniperWolf. SniperWolf is an American Youtube sensation who found fame thanks to her love for gaming (particularly Call of Duty), cosplay, as well as animation. Shelesh has been gradually parlaying her online fame into the mainstream. In April 2017, she added TV host to her repertoire when Fullscreen made her host of their new show titled 'Clickbait with SSSniperWolf'. She is a powerhouse in both the gaming community and social media as a whole and has partnered with countless brands for influencer campaigns. Her millions of online followers offer a clear reason why. In fact, when recently asked about influencer marketing and brand partnerships, Shelesh said "I think for 2019 we will see brands start to look more towards longer-term partnerships with influencers, as opposed to just one-offs, as they start to see the long-term value of being able to tell an authentic and consistent story to an influencers’ audience over time. Also, brands are finding it is more effective to promote over social media than traditional media." FunrForLouis, whose real name is Louis Cole, is a British travel vlogger notably known for his positive outlook on life, traveling, and charity. Oh, and not to mention his stunning photographs and visual social media content. His journey towards influencer stardom began in 2012 when he bought and refurbished a double-decker bus to travel in. Countless stunning images, world adventures, and positive vibes later, and he's become one of the most inspirational and popular travel influencers online. His motto is "Peace out, enjoy life, live the adventure", which he always preaches to his viewers, encouraging them to go out and enjoy life. What makes Cole special, outside of his unique personality and perspective on life, is his somewhat holistic approach to social media. Being both an influencer and a philanthropist with stunning social content, we expect Cole's star to rise to new heights in 2019 and beyond.